The current model is based on a few scans recorded with a Z+F IMAGER 5006. The laser-range finder is equipped with a rotating camera that provides colour information for the measured 3D points. 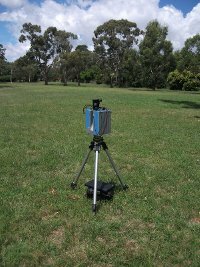 This system generates high resolution data (about 50 million points per scan) with large field of view, up to a distance of 80m in typical acquisition times of about 8 minutes. We also employ camera-based reconstruction methods. Bundle adjustment based on image features is then used to estimate the camera positions where images were recorded, followed by pair-wise dense stereo matching . H. Hirschmüller. Stereo Processing by Semi-Global Matching and Mutual Information. IEEE Transactions on Pattern Analysis and Machine Intelligence 30:328-341 (2008).